How I Can Change My Skins !!!!!!!!!!!???? 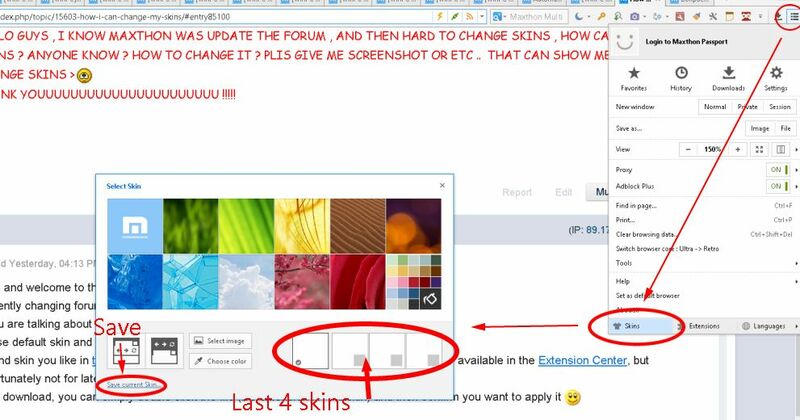 how to How I Can Change My Skins !!!!!!!!!!!???? Currently changing forum skin is not available but I hope this option will be added in the future. 1. Use default skin and be satisfied with changing it's color theme in Main menu > Skins. 2. Find skin you like in this forum section or in the old forum skin section. Some skins are also available in the Extension Center, but unfortunately not for latest Maxthon 4. M4 has its own skin maker available from the main menu. Once you've created one you can save it and access it any time using the same method. M4 will also save your last 4 skins for easy access.